Anonymous: Griffin. 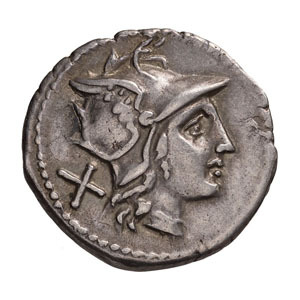 Denarius, 4.08gg. (7h). 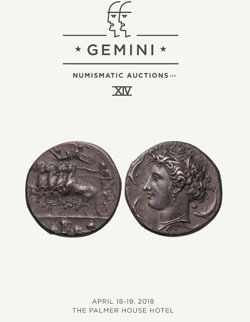 Rome, 169-158 BC. Obv: Helmeted head of Roma right, X behind. 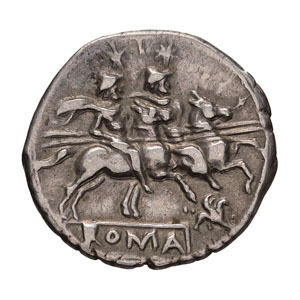 Rx: Dioscuri on horseback right, each with star above head and holding spear; griffin stepping right below front legs of horses, ROMA in linear frame in exergue. Crawford 182/1. Sydenham 283. Choice VF, nicely toned. Ex Philip T. Ashton Collection. Ex Berk 192, 9 October 2014, lot 130.